I have been searching for a concrete answer about this and have found, but not completely verified, the mystery of Goofy’s wife. While she appears in early shorts, we never get to see her face. Later on she does pass away, and Goofy is left as a widower to raise their son, Max alone. But there is some information that Goofy’s wife was named Penny (short for Penelope) Pooch. 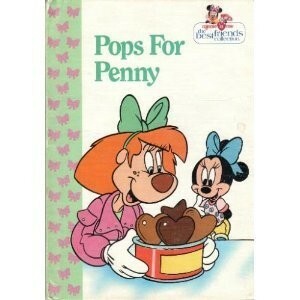 Could it be this Penny, a character from one of my favorite books Pops for Penny, which includes Minnie Mouse? Judging by the cover, though Penny and Minnie are younger, they are about the same age. It’s something to consider. « Walt Disney’s Words of Wisdom Could Fill a Book!